The idea of building a new home can be overwhelming for some, that’s why Ridgeroc Homes is with you every step of the way, day or night to take away any questions you may have and let you have fun in the process of creating your new home and lifestyle. The process of building a Ridgeroc Home first starts with your dreams and ideas of what you want to see in your new home, this stage is very important to us and we work with you to brainstorm and put all the pieces your have wanted into one. We will keep in mind your budget, size and layout of rooms, time lines and different lots that will suit your needs. This process should be fun and exciting, the more research and involvement you have in bringing Ridgeroc ideas will only help in the next stage of design. Now that we have an idea of your Budget, Location, style and general layouts we can start the DESIGN process. Ridgeroc will sit down with you and our Architect to discuss all of your ideas and start coming up with some preliminary plans to review. This is a no pressure process where we start with a concept to put your dreams onto paper, sometimes it takes multiple attempts with preliminary plans before you are happy to move forward. Once you are completely satisfied we will start finalizing your plans which include a full 3D version so you can see you new home from every angle to make sure it is exactly what you want. Now we are ready for the Permit stage. The exciting stage of breaking ground and starting the foundation of your new home has begun. Don’t worry Ridgeroc is still in constant communication with you the entire way through your build, we enjoy having you stop in and seeing the progress of your new home. 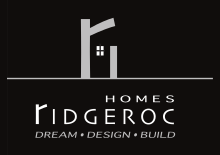 With the owners of Ridgeroc Homes you will never have to worry, we are always on site whether is pouring your footings, framing your home or working with our professional team of highly qualified trades. Questions often arise if things are still able to be changed once construction has begun, the answer is yes and we encourage you to have multiple walk throughs with Greg because we know that sometimes you can’t see how everything will look on paper. The team at Ridgeroc will be with you all the way, from picking your flooring, cabinetry, lighting, Paint colors and everything else to make you Ridgeroc Home the Dream you always wanted. Our suppliers are all very easy to work with and have the highest quality materials to choose from. We know you will be happy with your new Ridgeroc Home! The process doesn’t stop when we hand you your new keys, we are available for any questions anytime for peace of mind while you enjoy your new home.